This modern furnished villa, with a touch of tradition is located on its own fully enclosed garden with olive threes, where guests can relax by private swimming pool with sun beds, barbecue and a covered terrace with table and chairs. This spacious home features five bedrooms, which can comfortably accommodate 9 guests. On the ground floor you can find spacious living area with nice fireplace, dining room with direct access on the pool terrace, fully equiped kitchen, one double bedroom, bathroom and a separate toilette. On the first floor are four bedrooms and a bathroom. 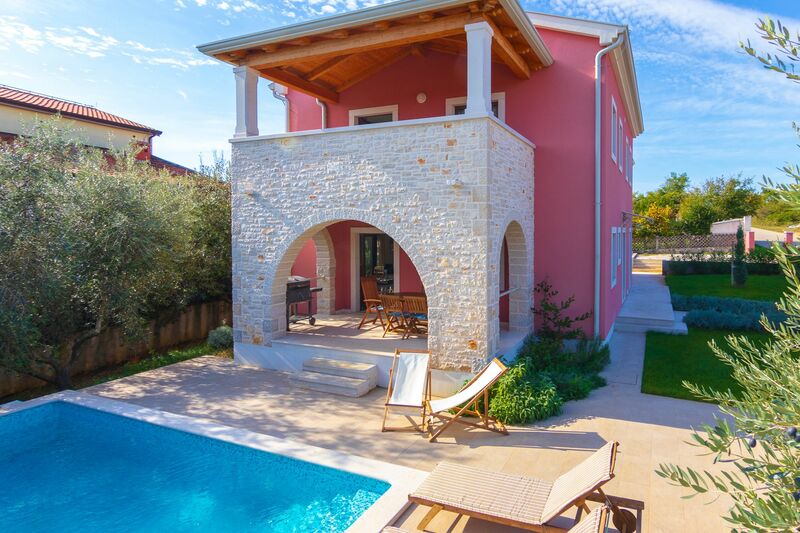 The villa is nested in a quiet neighborhood and offers tranquility, yet just a 3 km away from the center of Porec, one of the most populat tourist destinations on Adriatic coast.